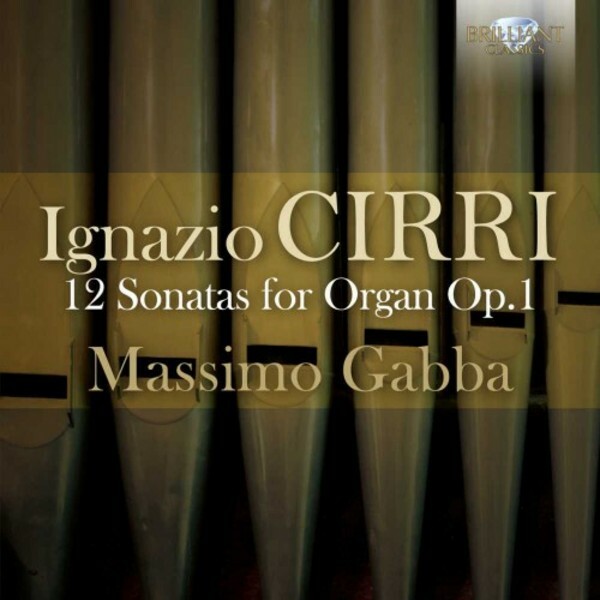 Ignazio Cirri lived the best part of the 18th century, a Maestro di Cappella of the Forli Cathedral in Italy. He wrote a large amount of liturgical music, but only two works were published - Violin Sonatas Op.2, and the present Organ Sonatas Op.1. Cirri�s sonatas are in pre‐classical style, and with their two movements form a bridge between the single‐movement sonatas by Scarlatti and Paradisi and the Viennese sonatas by Haydn and Mozart with their 3 movements. The writing is elegant and refined, and displays an excellent command of counterpoint. Massimo Gabba, one of the most notable young organists from Italy, plays a magnificent Grisante organ in the Parish Church of San Bononio in Pozzengo, originating from the early 18th century. All its specifications and a photo are included in the booklet, which is written in English and Italian.